Database Systems Corp. (DSC) provides state-of-the-art communications products and services including announcement systems and phone services at our multiple call centers. Employing our message broadcasting auto dialers, DSC delivers hundreds or thousands of phone announcements in just minutes! A pre-recorded phone message can be delivered to either an answering machine or to an individual call recipient announcing upcoming events, appointments, deadlines, or emergency alerts. And a different announcement message can be delivered to an answering machine versus a "live" call recipient. Simple to complex scripts can be developed for touchphone response. Calls can be directed to operators that are standing by or can be transferred to outside third parties. Personalized information from your custom database (such as name, appointment date and time) can be included in these phone reminders. In some campaigns, you may only want to leave a message if an answering machine is detected. In other campaigns, different messages can be played based upon contact with an answering machine or a person and based upon the time of day. An individual could be given a message with selection options using our interactive touchphone response system. Contact DSC to learn more about our phone announcement services and systems. DSC now provides an online signup for both non-profit and business organizations wishing to use our voice broadcasting outsourcing services. 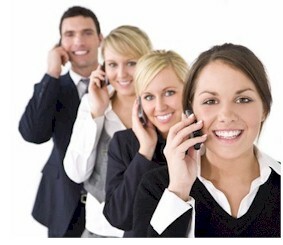 Our competitive rates are affordable, even for the smallest calling campaign. Using our voice broadcast service is easy and secure. Once you've signed up for our service, here's all you need to do. The National Multiple Sclerosis Society utilizes our voice broadcasting phone announcement service to contact individuals suffering from MS and to notify them of upcoming events. Our phone message delivery service and systems can be used for a wide range of calling campaigns. Here are just a few message broadcasting applications. Contact DSC for a FREE analysis and quote and to learn more about our call announcement services.